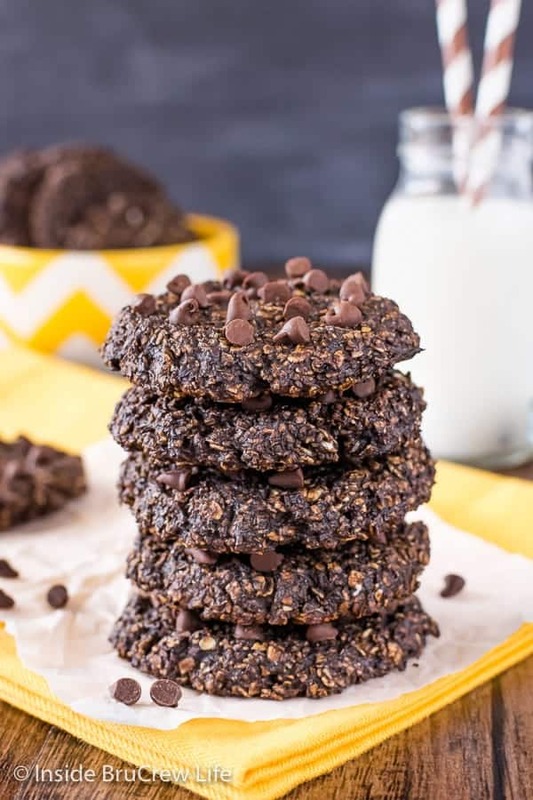 Peanut Butter Chocolate Banana Breakfast Cookies will have your kids up and dressed in no time, just so they can nosh on these tasty treats. 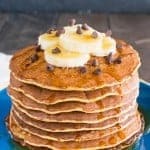 Plus, you’ll use up those black bananas! So last month my husband convinced me that we should do a workout challenge together. Lucky for me, he just meant we had to do the same thing, not actually workout at the same time. I’m glad he clarified that because there is no way that I want to get up at 5 am to do these crazy workouts before having some coffee. He decided that we would add 100 burpees into whatever else we decided to do for the day. Yup! You read that right. ONE HUNDRED BURPEES! EVERY DAY! The crazy thing is that I agreed to the madness! The first week was hard. I wanted to die. I wanted to quit. I wanted to give up and just eat brownies. But then it started to get a little bit easier. Week after week, I started to notice that getting those extra 100 moves in wasn’t as hard…or as bad. And I started to notice some muscle definition starting to happen in my arms. That was a bonus I hadn’t thought about when I started. So, this month I upped the challenge. 100 burpees PLUS 100 wall balls. I must be crazy. Or insane. Although, I think in order to get through another month of workout torture, I’m going to need to increase my chocolate consumption. Modified of course because I do not want to ruin all that hard work. 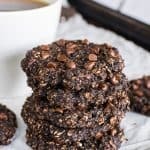 The past few months I have been trying to come up with a few healthier desserts and breakfast treats that we can indulge on without all the extra calories. 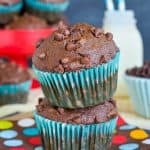 So far, this Healthy Chocolate Lava Cake has my vote for the top recipe! I could eat it every single day!!! 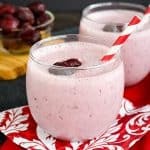 I love keeping cups of these Low Carb Cherry Jello Parfaits in the fridge for an easy snack. 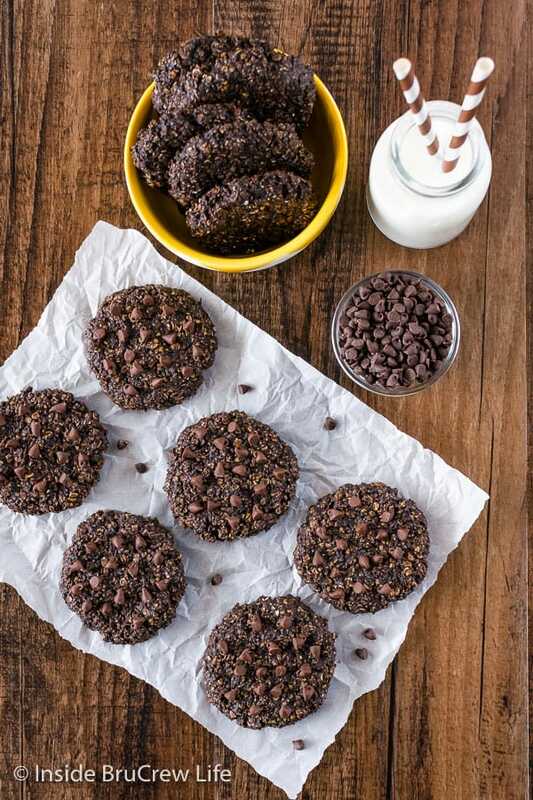 The best part is that you can change up the flavor every time you make them. 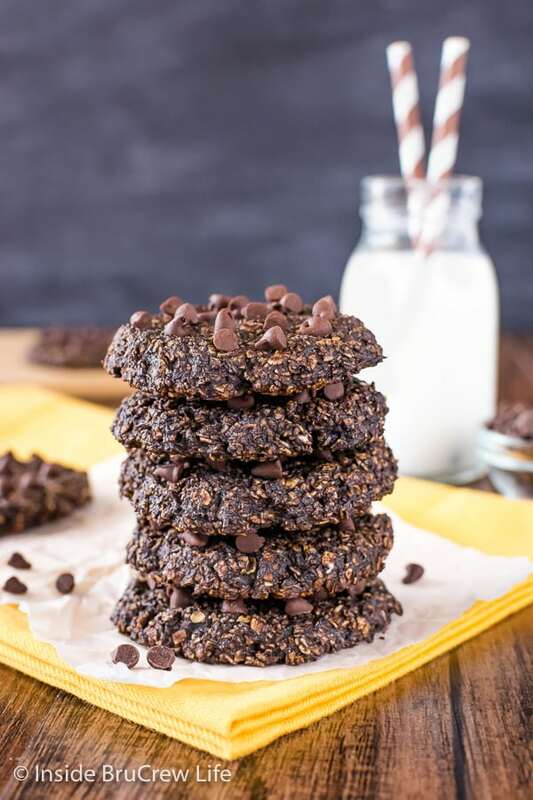 And every time I pick up a bunch of bananas I make some more of these Healthy Banana Chocolate Chip Breakfast Cookies. 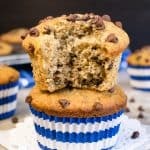 Usually I add some protein powder, but this time I added some peanut butter powder in place of it. It was a nice change of pace. Mash the bananas. 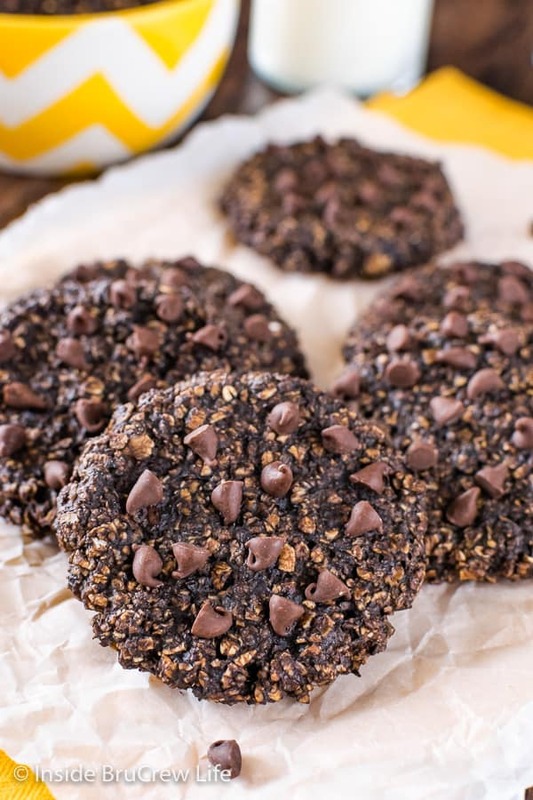 Mix together the oats, cocoa, peanut butter powder, and banana in a bowl. Drop the mixture into 15 even scoops on a cookie sheet lined with a Silpat. Press each mound out with the palm of your hand and shape into a circle with your fingers. 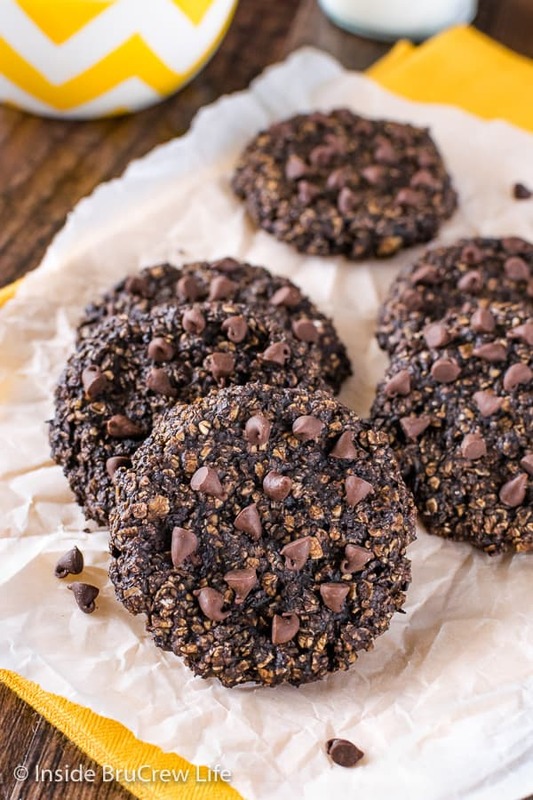 Press a few chocolate chips into the top of each cookie and sprinkle with a little bit of sea salt. Bake for 15 minutes and then remove and let cool. 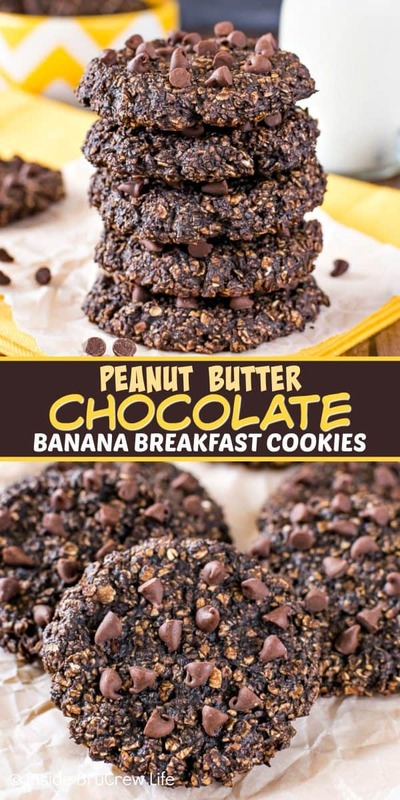 Be sure to head over to Food Fanatic where I’m a breakfast contributor and print the Peanut Butter Chocolate Banana Breakfast Cookies recipe. 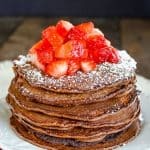 These Skinny Chocolate Banana Oatmeal Pancakes are delicious and full of protein. Just what you need to get going in the morning. Fresh fruit and granola on top of these Raspberry Orange Frozen Yogurt Bowls is just the healthy snack you need this afternoon. You only need three ingredients to make these Broccoli Cheese Egg Muffins. 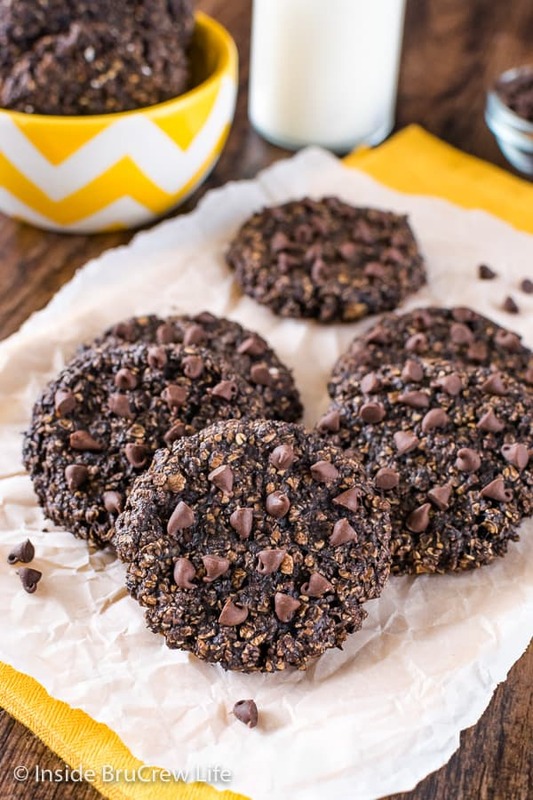 They are an easy and healthy way to start out the day. Frozen fruit, juice, and yogurt gives this Triple Berry Orange Smoothie a delicious and healthy blast. It’s exactly what it sounds like. They press the peanuts to remove most of the oil, then grind it into a powder form. This process removes most of the fats, so you are just left with the proteins and fiber. Walmart carries it, and I believe it’s in the baking aisle of the store.